Well maintained freshwater boat! So much space for a 28 foot monohull sailboat. This boat has been owned by an involved owner on Lake Travis in central Texas. She has recently undergone several improvements to make her attractive to her new owner including a new Bottom Job! 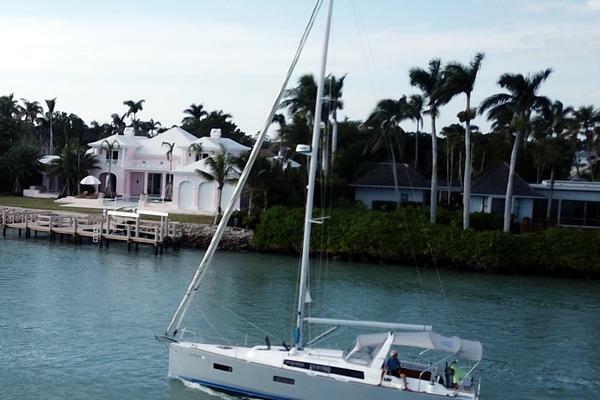 West Florida Yachts would love to guide you through a personal showing of this 28' Beneteau Oceanis 281 1997. This yacht for sale is located in Austin, Texas and priced at $29,900. For a showing please contact us by filling out the form on this page and we will get back to you shortly! Conceived by Groupe Finot and Beneteau, this 28 footer completes the Oceanis range, recognized worldwide by those who enjoy coastal and long-distance cruising. The Oceanis 281's specification has all the qualities of an Oceanis: reliability, safety, performance under sail, easy handling, and as much comfort at sea as in port. In addition, the proven technical solutions in this range have been retained: solid hull, glued and laminated structural inner hull molding - providing a real frame - and a sandwich deck for insulation and rigidity. The rigging on the Oceanis 281 includes swept back spreaders for greater mast control, standard furling genoa, and semi-full battened main with lazy jacks cover and rapid reefing. In addition to easy handling and furling, this solution adds to the performance and safety of the Oceanis 281: the shape of the sail is more efficient than a furling sail, and the suppression of weight in the uppers contributes to the boat's stability. The often cumbersome mainsheet track is no longer necessary thanks to the presence of a very powerful rigid boom vang. In port, the sheet purchase tackle, equipped with a snap hook, is easily released to completely free the cockpit. The main handling lines are led aft to the cockpit onto a winch to starboard. The cockpit also has a large locker to starboard and a door in the transom providing easy access to the bathing ladder and the standard cockpit shower. The U-shaped saloon ensures maximum comfort for six around the large table. Natural lighting comes from the fixed portlights either side of the hull, and ventilation from the opening hatch in the coachroof and the opening portholes in the coaming. The L-shaped galley to port of the companionway will get the measure of the crew's appetite: 2 burner gimbaled hob, with opening porthole just above, cutlery drawer, sliding vegetable basket, and a large icebox that can be converted to a refrigerator (option). To starboard, the nav. station has a large chart table with stowage, bookshelf, and space reserved for electronics. 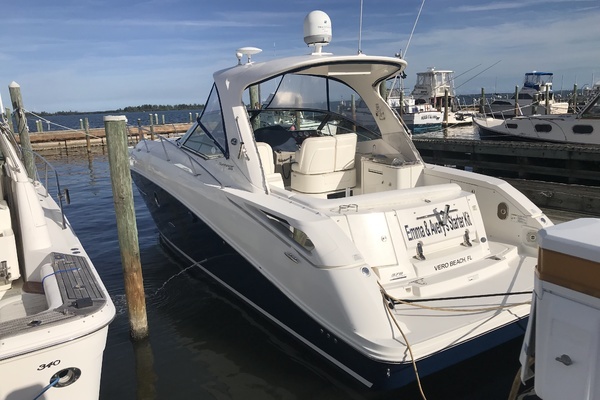 The wet locker, close to the companionway steps, is located between the nav. station and the vast head compartment - molded in one piece - which has pressurized shower, wash basin, marine toilet, and numerous lockers. The length of the forward berth is adjustable making it a full double berth big enough to accommodate the larger members of the crew. The aft cabin has a double athwartships berth exploiting the boat's beam at cockpit level.